How well can you translate Gulzar’s works into English? Writer and diplomat Pavan K.Varma has walked the tight rope to do the same. As a result, in a brand new bilingual poetry collection, we have Gulzar’s Hindi originals on the left side of the page, to Varma’s English translations of the same, on the right. The story behind the book: One day, after a long gap, Gulzar abruptly called up Varma and told him, “As several of my poems have been lying neglected for the need of publication, we shall call this collection – Neglected Poems.” What was thus uttered frivolously came to be the book title. 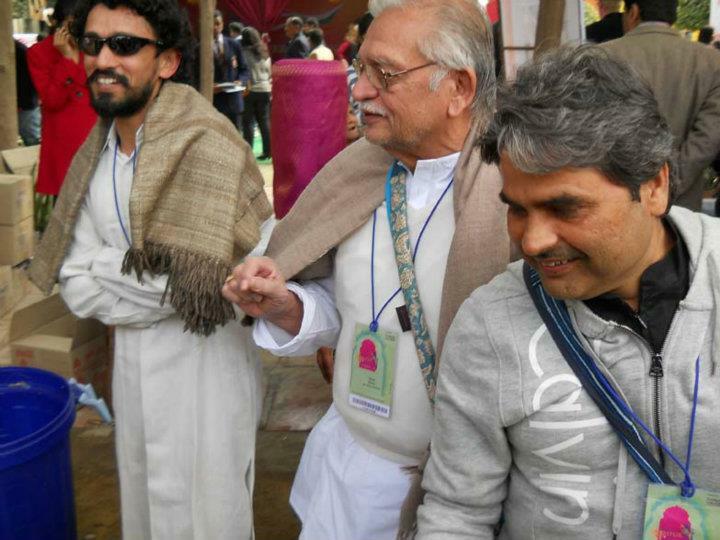 Gulzar and Varma alternatively read some selections at the post lunch session on January 20th 2012 at the Mughal Tent. The session was named after a popular Gulzar song: Do Deewane Shehar Mein. The audience that had accumulated at the venue was all ears to the poet’s rendition. Those who couldn’t find seats positioned themselves near the speakers, and were content to take in each word. Some sat with their eyes closed, some held up their recording devices even as Gulzar’s mellow voice flowed through the gathering. Varma’s translations did show that the work was in good hands. This wonderful, evocative session on poetry made a great start to what was the first day of the Jaipur Literature Festival 2012.